The First Rule Of Being Your Own Boss? Be Authentic. You have to be yourself to make your own way in the business world. We continue our Leadership Hall of Fame series, a year-long look at the top business books and authors, with an excerpt from Free Agent Nation (2001) by Daniel H. Pink. Perhaps the ultimate freedom is the freedom to be one’s self. But in the traditional workplace, authenticity is often neither condoned nor rewarded. As free agents around the country told me their stories, they repeatedly used the language of disguise and concealment to describe their previous jobs. They spoke of putting on “masks” or “game faces” at work. They talked about donning “armor” and erecting “smoke screens,” because exposing themselves in a large organization could be perilous. Only when they returned home after work could they shed the costumes and protective gear and return to being who they truly were. This personality split–Mr. Hyde at work, Dr. Jekyll everywhere else–can take its toll. Public relations guru Deborah Mersino recalled a conversation with her fiancé that convinced her to go solo. After she’d returned from another bruising day on the job, he told her, “You are not you anymore.” Walt Fitzgerald, a GE veteran, told me that compromising his identity was his greatest workplace fear: “I think the biggest ongoing risk I faced was being myself in a corporate environment.” Both the Calvinist ethic–and the workplace it infused–tended to flatten identity and homogenize individuality. The Gregory Peck movie wasn’t called Tom Rath. It was called The Man in the Gray Flannel Suit because to the giant corporation where he worked, the costume was more important than the soul that inhabited it. Joan Tyre, hardly a Marxist, would have understood this analysis. She spent twenty years working for large organizations like Sheraton and Miller-Freeman, where she planned meetings and organized conferences. But in her late forties–in an act that “was the single most scary thing I had ever done in my life”–she became a free agent. She now works for herself from her home in Brooklyn. In free agency, work becomes more fully integrated with who you are. That can be rewarding. But because work is more deeply woven into yourself, it can be harder to cast off–which means work can occasionally consume and even smother identity. Yet this urge for authenticity and self-expression is pervasive. “These are all byline occupations,” Charles Handy says of independent workers, “meaning that the individual is encouraged to put his or her name on the work.” Joan Tyre’s one-person microbusiness is Meetings by JT. Allison Cutler calls her Nashville, Tennessee, political consultancy the Cutler Group–a “group” that she says consists of “me, myself, and I.” Nothing new about this approach to naming. Think of the millions of Americans whose surnames describe some ancestor’s occupation: Baker, Miller, Farmer, Skinner, or Taylor. Even the ultimate free agent movie, Jerry Maguire, bears the name of its protagonist. And it’s probably no accident that Jerry Maguire compared his manifesto to The Catcher in the Rye. What did Holden Caulfield detest more than anything else? Phonies. As Fast Company declared in its inaugural issue, and as free agents affirm each day, “Work is personal.” So forget the Pledge of Allegiance. In Free Agent Nation, people take a Pledge of Authenticity. Read more from Free Agent Nation or our Leadership Hall of Fame. 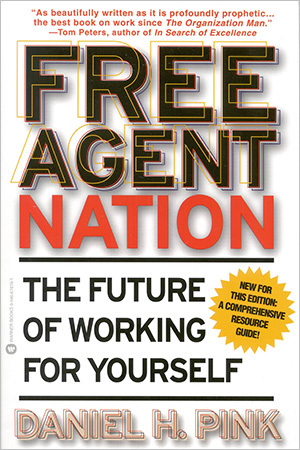 Excerpted from FREE AGENT NATION: How America’s New Independent Workers Are Transforming the Way We Live by Daniel H. Pink. Copyright © 2001 by Daniel H. Pink. Reprinted by permission of Business Plus/Grand Central Publishing. All rights reserved.